The menacingly handsome, retro-cool and capable ZRX series has been with us for a decade now, so how does it fare as a used buy? Bertie Simmonds finds out. Synonymous with the Kawasaki muscle bikes of old and Eddie Lawson's 1980/'81 AMA title-winning inline fours, the ZRX series is actually a little more than that. The bike first came into being in 1997 in 1100cc form, sporting a retro square headlight, twin shocks, braced swingarm and looks that were a mix of Eddie's AMA Superbike and the Z1-R from the 1980s. With a 112cc increase in capacity for 2001 came another two models - the half-faired 'S', which didn't play the rose-tinted glasses card and instead concentrated on being a value-for-money, big-bore, do-it-all daddy, and the bikini-less R version, which had the square headlight changed for a round one, giving it a more big Zed lookey-likey feel. All versions had the robust, reliable ZZ-R1100 motor as a base, along with old-fashioned carbs, analogue clocks and fuel-tap. In retro tests since, the ZRX1200R in Eddie Lawson green has always shown well against more modern machinery on looks alone. Despite what some owners say, the ZRX isn't quite the torque-laden arm-ripping monster you'd expect it to be, but it's still got plenty of 'oomph'. The best bit is that, despite not having the biggest cubes in its class, the revvier Kwak does make the most power. While the ZRX loses out at the bottom and midrange to its rivals, where most of them have tailed off at 7500-8000rpm the Zed pulls on towards a 120bhp peak at around 8500rpm. Lovely. Servicing takes place generally every 4000 miles. Whack a set of ZZ-R1100 cams into the ZRX1100 and voila - more poke! Obviously the carbs will need re-jetting for it all to work properly (see below). These bikes are pretty sensitive to poor set-up. If you fit an end can or a full system - or ZZ-R cams (see above) - make sure you get the thing checked out on a dyno, and get any re-jetting done by a reputable tuning house. Despite being a 'big-bore' bike, the ZRX inherits the rev-happy nature of the ZZ-R it got its motor from. To give it a bit more oomph, do what many owners do - go one tooth down at the front and one up on the back. A couple of Renthal sprockets will set you back around £50, and they're easy to fit. Pretty good by retro standards. The six-pot calipers are from the ol' ZX-7R and benefit from decent braided hoses and softer pads. Carbone Lorraine, EBC HH and Bendix pads perform well. In the main, ZRXs are very well finished when it comes to paint and general chassis parts, but there are some exceptions. Owner Mick Farmer: "The bolts seem to be made of cheese or are of the lowest quality possible. Easily replaced though with some good quality stainless ones at a small cost." Banjo bolts for brake lines are the same. Pretty basic stuff as it goes, but useable enough if you're a steady rider. If you're not, there are things you can do to sort it out. Most top-line suspension outfits do progressive fork springs and adjustable rear shocks for the ZRX, with …hlins, WP and Hagon among the most popular. A set of saucy fully-adjustable …hlins shocks will cost the thick end of £600, while the more moderately priced Hagons will do almost as good a job, but cost £360. Fork braces are also available. If you're used to sportsbikes, this is a heavy, slow-steering beast, but an easy and worthwhile handling mod is to rotate the eccentric chain adjusters by 180 degrees. The result is around 20mm extra rear ride height, making the steering usefully quicker. Don't spares prices make you laugh? Take the ZRX. If you want the original OE Kawasaki bars they'll cost around £90-100. Perfectly good Renthal replacements will set you back less than £20. Ridiculous. With Kawasaki UK selling shed-loads of green Eddie Lawson replicas, only a few changes were made year-on-year. Sometimes the side-panels were colour-coded, sometimes they were black. Same with the pillion footpegs: one year polished, the next painted black. Sadly the paint finish isn't too good on these, with moisture getting under them and ripping up the paint. It can be the same on the engine. Some owners have reported successful warranty claims to get replacement parts. With the first 1100 model surfacing a decade ago and the half-faired S and bikini/unfaired R models popping up in 2001, there's a model available for all tastes and pockets. More importantly, with the model being deleted in 2007 thanks to stringent Euro 3 emissions laws, there's plenty of deals on the latest 2006 version. We've seen 'em advertised for between £5300-£6000. That's a big saving on a £6745 list price. Aftermarket parts are popular on the retro-styled Rs and a little less so on the more practical S. Renthal bars abound, as do end cans such as Yoshimura RS-3s, Blueflames, Microns and the like. Free-breathing full exhaust systems are also popular with many owners with Akrapovic and any Muzzy/Kerker Yank imports considered the Holy Grail. Crash bungs are popular to save the naked bottom half of the bike as well as bolt kits and braided hoses and oil line pipes. The big inline four is pretty good for fuel, capable of mid-40s mpg if ridden steadily, with the 20-litre tank (the smallest of the retros... ) draining to reserve (and its annoing fuel tap) at around 140 miles. That makes for a potential range of up to 175 miles or so. 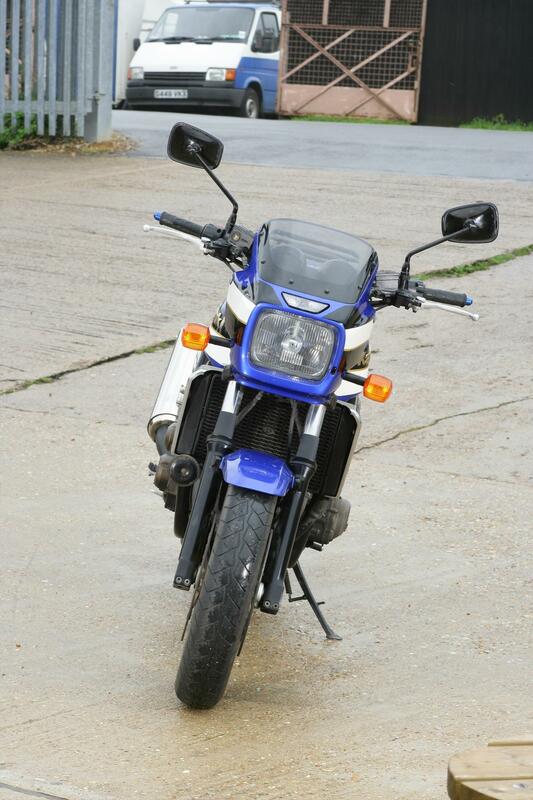 This bike does suit the mainly sports-touring tyre. Popular ones are Bridgestone BT020s, Metzeler Roadtec Z6s and Conti Attacks. Sportier hoops can sit on the rims, but you'll lose a little stability and get a bit of tramlining when the tread gets low. In September 2001 a recall was issued over the incorrect routing of wiring on the 1200R, which could lead to the indicators and instrument lights not working. All our prices are sourced from genuine trade and private ads in a variety of real-world publications. Read it, believe it! Comments: With a 1052cc engine coming from the mighty, once world-leading ZZ-R1100 of the 1990s, the bike was de-tuned to around 100bhp, but with a chassis and body clothes from 20 years before that, in the style of the late, great Z1-R, Z1000 etc. 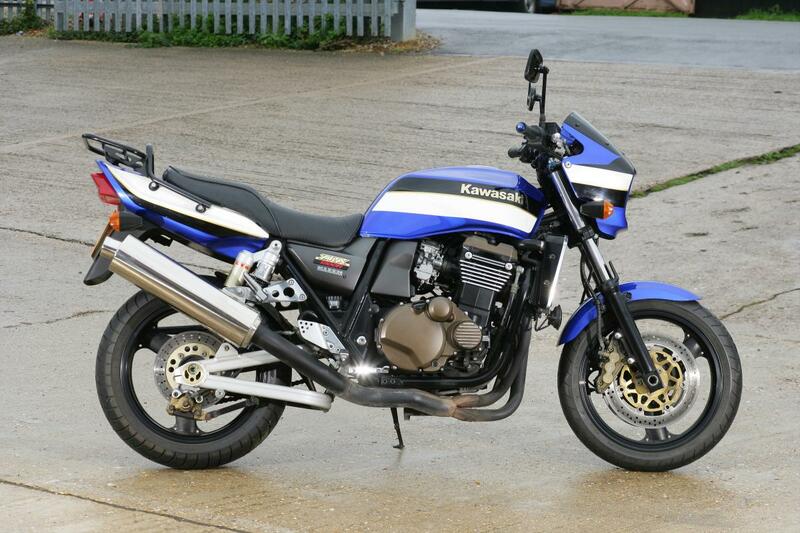 Along with Yamaha's XJR1200/1300, it was the best-looking of the retro-style muscle bikes. Comments: In came a bigger motor (1164cc), more power (around 115bhp) and little else. Colours changed marginally over the years but the Eddie Lawsonesque green was and still is the favourite. Variations include the R without the useful bikini fairing and the S (2001-2003; price now: £3195-£4800) with its very practical half fairing. analogue clocks and fuel-tap. In retro tests since, the ZRX1200R in Eddie Lawson green has always shown well against more modern machinery on looks alone. 1. Engine Despite what some owners say, the ZRX isn't quite the torque-laden arm-ripping monster you'd expect it to be, but it's still got plenty of 'oomph'. The best bit is that, despite not having the biggest cubes in its class, the revvier Kwak does make the most power. While the ZRX loses out at the bottom and midrange to its rivals, where most of them have tailed off at 7500-8000rpm the Zed pulls on towards a 120bhp peak at around 8500rpm. Lovely. Servicing takes place generally every 4000 miles. 2. ZZ-R cams Whack a set of ZZ-R1100 cams into the ZRX1100 and voila - more poke! Obviously the carbs will need re-jetting for it all to work properly (see below). 3. Jetting changes These bikes are pretty sensitive to poor set-up. If you fit an end can or a full system - or ZZ-R cams (see above) - make sure you get the thing checked out on a dyno, and get any re-jetting done by a reputable tuning house. 4. Gearing Despite being a 'big-bore' bike, the ZRX inherits the rev-happy nature of the ZZ-R it got its motor from. To give it a bit more oomph, do what many owners do - go one tooth down at the front and one up on the back. A couple of Renthal sprockets will set you back around £50, and they're easy to fit. 5. Brakes Pretty good by retro standards. The six-pot calipers are from the ol' ZX-7R and benefit from decent braided hoses and softer pads. Carbone Lorraine, EBC HH and Bendix pads perform well. 6. Finish In the main, ZRXs are very well finished when it comes to paint and general chassis parts, but there are some exceptions. Owner Mick Farmer: "The bolts seem to be made of cheese or are of the lowest quality possible. Easily replaced though with some good quality stainless ones at a small cost." Banjo bolts for brake lines are the same. 7. Suspension Pretty basic stuff as it goes, but useable enough if you're a steady rider. If you're not, there are things you can do to sort it out. Most top-line suspension outfits do progressive fork springs and adjustable rear shocks for the ZRX, with …hlins, WP and Hagon among the most popular. A set of saucy fully-adjustable …hlins shocks will cost the thick end of £600, while the more moderately priced Hagons will do almost as good a job, but cost £360. Fork braces are also available. 8. Handling If you're used to sportsbikes, this is a heavy, slow-steering beast, but an easy and worthwhile handling mod is to rotate the eccentric chain adjusters by 180 degrees. The result is around 20mm extra rear ride height, making the steering usefully quicker.